Long out of print. Haymarket has published it now with a new forward by Pervez Hoodbhoy. Confronting Empire is probably Barsamian’s most influential interview book. 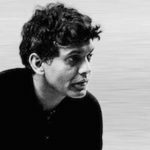 Eqbal Ahmad was a pleasure to read. Great minds are so rare.